Starbucks competitors including McDonald's and Dunkin' Donuts would be wise to carve their own seasonal niches rather than copy a pumpkin-spiced favorite. PORTLAND, Ore. (TheStreet) -- Setting your calendar to Starbucks (SBUX - Get Report) pumpkin spice latte is a bit basic, but reeling in repeat customers with a signature seasonal items is basically just a great idea. The Starbucks pumpkin spice latte inhabits a place in our culture that the coffee chain's fast-food competitors and retail counterparts just can't find. In its 11th year of existence, the pumpkin spice latte has its own Twitter feed (@TheRealPSL), its own Tumblr, a post-Labor-Day release date, secret codes to get the drink as early as Aug. 26 and lengthy historical accounts and passionate defenses from esteemed publications. The flavor has been replicated so often by competitors including McDonald's (MCD - Get Report) , Dunkin Donuts (DNKN - Get Report) and even Mars' M&M's, that the amount of "pumpkin spice"-- a mix of pumpkin, nutmeg and cinnamon -- in food served by restaurants increased 234% from 2008 to 2012, according to Datassential Menu Trends. The knockoffs are flattering -- especially with limited-time menu offers up 143% over the same period -- but why hasn't anyone tried to stake out a portion of the calendar for themselves? Why hasn't McDonald's made the McRib a staple of summer barbecue season? Why hasn't Panera (PNRA introduced a limited-edition cinnamon bread to coincide with the holiday shopping season? Why isn't anyone savoring the first Blood Orange Orangina of spring? It's not because the pumpkin spice latte has shown any weakness. Starbucks chief executive Howard Schultz said on an earnings call last year that the pumpkin spice latte is still Starbucks' most popular seasonal drink. Starbucks Chief Financial Officer Troy Alstead at one point outright admitted that "We are continually, frankly, even amazed internally at its ability to keep driving its proposition, comping over itself every year." 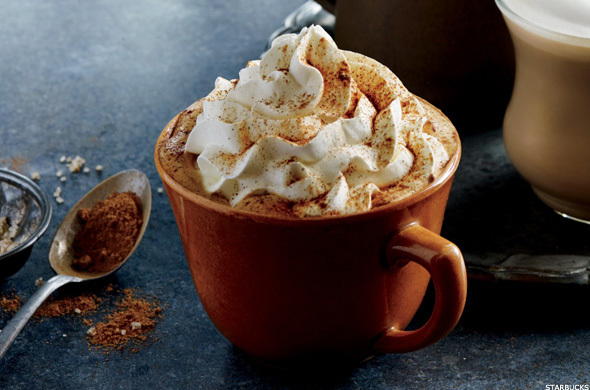 During its 10th anniversary last September, Starbucks noted that it had sold nearly 200 million pumpkin spice lattes since 2003. At a median $4 a pop, that's $800 million from one drink alone. That roughly $20 million a year helps push Starbucks into what are typically its strongest portions of a year in the fourth and first quarters. Starbucks' annual revenue chart for the year looks a whole lot like a ramp, at its lowest point in spring but climbing each quarter into the dead of winter. The cold has something to do with that, but sales in the fourth quarter -- when pumpkin spice latte hits its peak -- climbed 13% last year from a year earlier. That's inspired a whole lot of impostors, but no other signature seasonal items on the same cultural scale as Starbucks' spiced specialty beverage. The McDonald's McRib is frequently thrown into the same category, but it isn't offered every year and, when it is, it often isn't offered nationwide. Though previous McRib releases have aimed for October or November, the folks at The Awl noted three years ago that those dates just happened to coincide with low points in the pork market. A more apt point of comparison for the pumpkin spice latte isn't found at fast-food counters or in doughnut shops, but in the beer aisle. Pumpkin beer is a huge portion of a seasonal beer market that accounts for 15% to 25% of the more than $14 billion in annual craft beer sales, according to market research firm Symphony IRI. Though seasonal beers have actually been losing ground to India Pale Ale, which saw a 36% spike in IPA sales at off-premise locations (bottle shops, supermarkets, Targe, Walmart) during the first half of last year, pumpkin beers flip that advantage by fall. Sales of IPA typically outstrip those of seasonal beers by 300,000 cases or so a month, according to the Brewers Association craft beer industry group, but fall seasonals completely wiped out that lead last year. After trailing IPAs by 125,000 cases in August 2013, fall seasonal beers opened up a lead of more than 300,000 cases in both September and October. Both fall and winter seasonals holding held that lead through November and December. 'Thats been a huge deal for craft beer, which saw sales increase 17% by volume in 2013 as overall beer sales dropped 1.9%. Amid increasing revenue and same-store sales for Starbucks, the pumpkin spice latte has been similarly effective. With Dunkin' Donuts' growth and sales lagging, Burger King (BK buying up Tim Hortons as its own coffee sales sputter and McDonald's same-store sales in the U.S. declining, Starbucks' seasonal strategy seems like a great way to heat up sales during one of the coolest periods in both restaurant and retail. With everyone else content to either replicate the pumpkin spice latte or hibernate for the season, Starbucks and its cozy fall beverage continue to contentedly co-opt and entire season for the benefit of their brand. A short, relatively simple burst of corporate creativity made the pumpkin spice latte synonymous with fall. That nobody else could manage even that much effort to stake out another portion of the seasonal schedule speaks volumes about why Starbucks succeeds as larger competitors struggle.